In the third post in our series on solar pumping systems, we’ll start our discussion with sizing a submersible solar pumping system. With today’s web tools, sizing is usually remarkably easy, as most solar manufacturers offer some type of online sizing tool. For our example, we’ll use Franklin Electric’s SolarPak Selector. 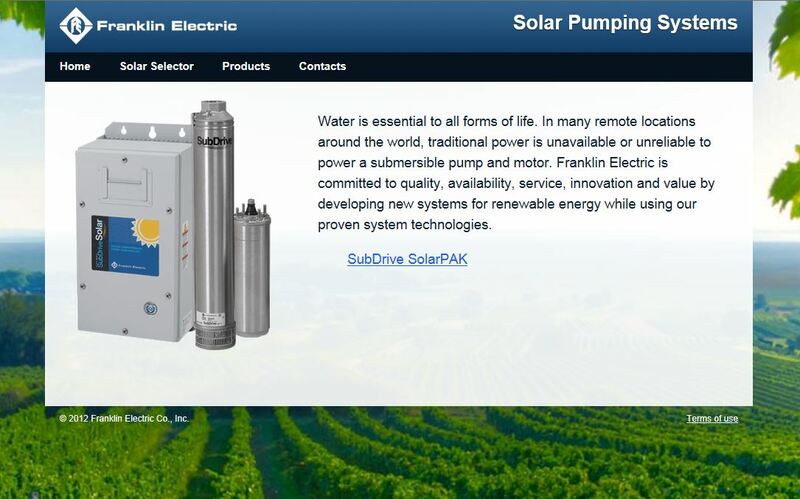 To find it, go to www.franklin-electric.com/solar, which will take you to Franklin’s solar home page. 3. What are the electrical characteristics of my solar panels? In the first step, the system calculates how much sun should be available based on the latitude and longitude of the installation. Chances are, you don’t have those numbers handy, but that’s not a problem. Although you can enter the latitude and longitude of the installation directly, an easier way is to select “Look up Your Latitude and Longitude”. With this option, a map will pop up and give you two options: 1) move the crosshairs on the map to the location or 2) simply enter the name of your location in the box at the top of the page and the SolarPak Selector will do the rest. If you do enter the latitude and longitude directly, don’t forget that in the Western Hemisphere, longitude is expressed as a negative number. You also have the option to use the device’s location (iPad, laptop, etc.). 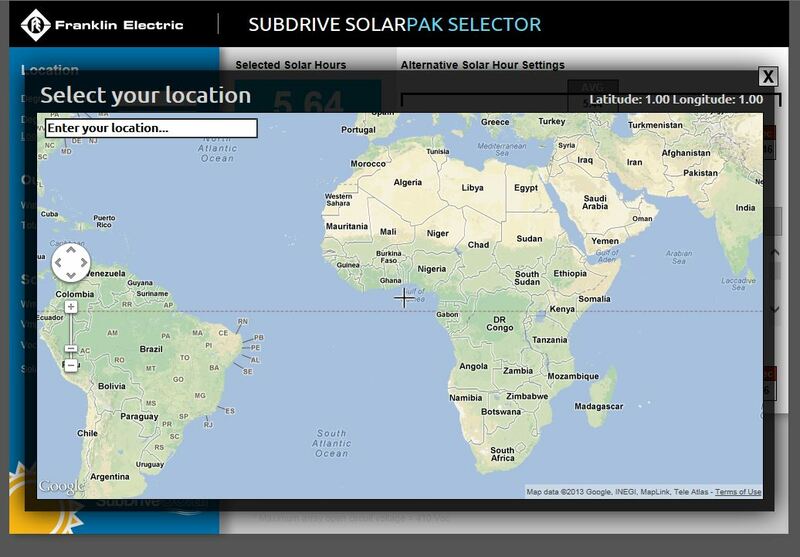 As soon as you open the SolarPak Selector page, you should see a pop-up menu that asks for permission to track your physical location, as you can see on the bottom of the screen shot above. If you allow this, your coordinates will automatically load into the SolarPak Selector. Of course, your device should be somewhat close to the installation’s location for this to work properly. 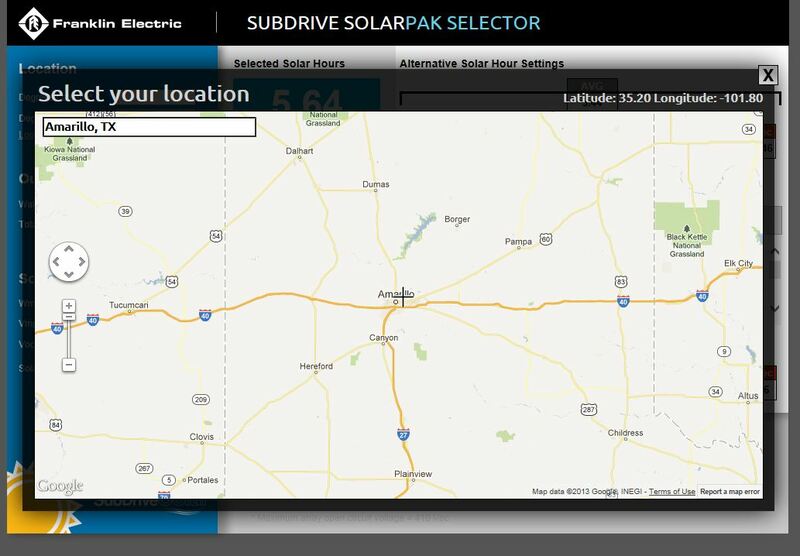 For our example, we’ll use Amarillo, Texas, which we would enter into the box at the top left of the screen. 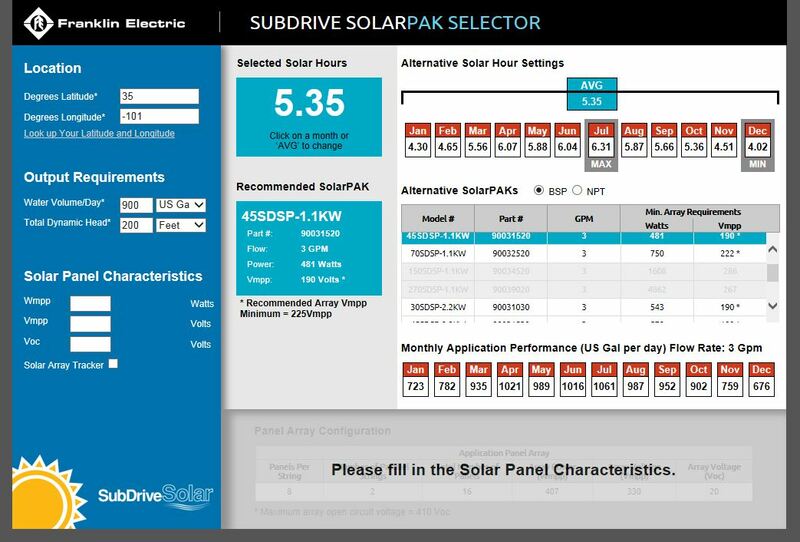 The SolarPak Selector calculates that on average, Amarillo receives 5.35 hours of usable sunlight each day for our solar pumping system. Step 2 (and actually, the order here doesn’t matter) is to specify how much water we need per day and at what total dynamic head. Note that our volume requirement per day can be expressed in cubic meters (m3), gallons, or liters. The drop down box allows you to select your unit of measure. Similarly, Total Dynamic Head can be expressed in meters, feet, or PSI, again specified with the adjacent drop down box. For our example in Amarillo, we’ll say that on average, we need 900 gallons per day at 200 feet of head. We enter this into the Output Requirements section on the left of the SolarPak Selector page. Once we enter this information, the SolarPak Selector goes to work and provides us with a wealth of information, including which Franklin system is recommended for this installation. The only input we haven’t covered is solar panels. Simply enter the manufacturer-listed Wmpp, Vmpp, and Voc values (covered in our last post) into the boxes provided in the section called Solar Panel Characteristics. 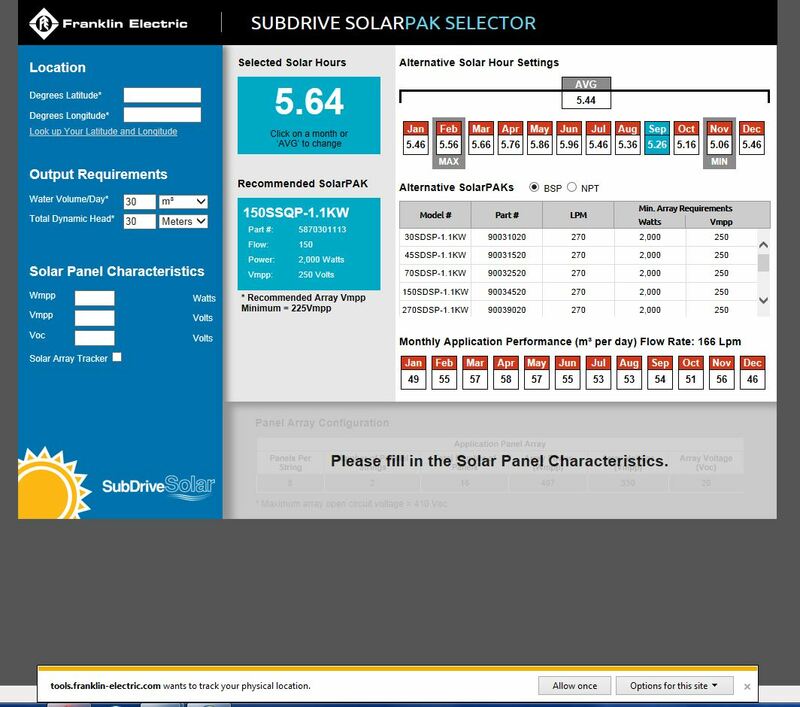 The SolarPak Selector will do the rest, helping you define your array. That’s all the information the Solar Selector requires to size the system. In our next post, we’ll move on to what information the Solar Selector does with that information.